Our plan for this motorhome trip to France is to drive south to the Bordeaux area and to spend several nights staying at France Passion motorhome stopovers. Just in case you think this type of stopover is something dodgy I can tell you that it’s an organisation offering motorhome stopovers at vineyards, farms and regional product producers. Overnight stops are free and you have the opportunity to sample the products, although there is no obligation to buy. 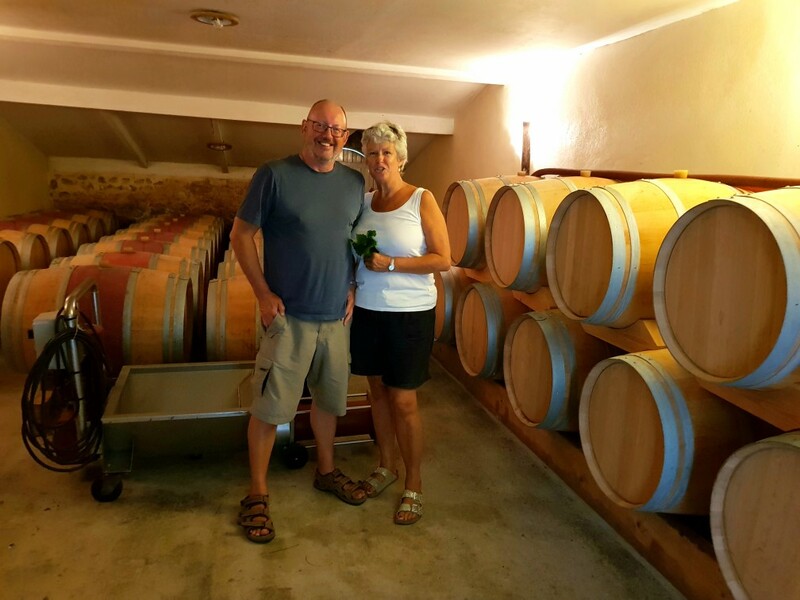 Around the Gironde estuary there are dozens of France Passion stops and hopefully we can spend a few nights at some well known wine producers and stock up our wine crate. When our wine crate is full we plan to have a weeks holiday! In the last 12 months we have been travelling through several countries and driven 12,000 miles in our motorhome, so we decided it would be good to spend a week in one place so we can swim and relax before continuing our motorhome journey through France. After our ‘holiday’ our plan is to drive east to the French Alps and visit Chamonix before meeting our good friends, and dedicated Francophiles, Lynne and Mark in Provence. Brittany is an area of France that we haven’t visited for 30 years so when we crossed the border with Normandy we were looking forward to seeing a little of the area. Our first stop was at the tiny village of Perret, population 160, and right in the centre of Brittany. Our friends John and Jan, who we met in Spain last winter, live in the village and kindly offered us a parking place in their garden. John and Jan are very involved in the Perret community and the next morning I offered to help John with setting up the Bastille Day event. This involved lifting heavy beer casks and cases of wine from a nearby barn into a car and at the same time preventing a pet goat from escaping from the garden! That afternoon the whole village turned out for the celebrations which included a very nice hog roast dinner and plenty of beer and wine. The 15th century chapel in the village of Perret, Brittany. The next day we visited a typical French Sunday morning market and a ruined abbey called Bon Repos, which overlooks the Nantes-Brest canal. We also had chance to visit the amazing chapel in Perret. It was built in 1425 and has hardly changed since that date. Bridge over the Nantes-Brest canal. John and Jan have done a great job of integrating into their local village community and I really respect them for that. They take French lessons and volunteer for many things and for that they are highly respected by the locals. After a lovely traditional English Sunday roast lunch with John and Jan we set off for Vannes in south Brittany. Vannes is a walled town with narrow cobbled streets, medieval gates and wooden houses. Unfortunately, we didn’t get to see any of this because we had parked at the Aire, which is out of the town centre, and the bus only runs every hour. With the temperature being 31c we didn’t fancy a sweaty bus ride so decided to come back another time. The day we were in Vannes was also the evening of The World Cup final between France and Croatia and it was good to witness the celebrations of the French victory and local French drivers being a little over enthusiastic with their car horns. Saint Jean de Monts is a seaside resort town in western France and as it was on our route south we decided to spend a night at the Aire (€12 a night). We found the town to be uninspiring, although the French seem to love it. The many expensive campsites and long life guard controlled beach as well as ‘monster truck’ events appear to be the main attractions. One night for us was enough and the next day we were driving south again. It often pays to look off the beaten track for motorhome stops. I love the Camper Contact app. for finding good places to stop. After 3 hours driving I found a free municipal Aire in the small village of Saint Romain-de-Benet, not far from Royan in Charente Maritime. With space for 20 motorhomes we were the only one there. The village was lovely and I visited the village bakery to buy a few things as I try to support local business. The only motorhome in this free Aire. The only thing of note about Saint Romain-de-Benet, apart from beautifully restored village houses and a historic church were the church bells. For some reason the church bells would ring on the hour and again one minute later. We have found many beautiful French villages on our journey so far through France but an interesting fact about Saint Romain-de-Benet is that the population of the village in 1763 was 1,260 and the population now is only 400 more. Our motorhome parked at Chateau d’Osmond in the Medoc region of France. Having chosen a suitable vineyard in the Médoc region just north of Bordeaux from the France Passion book we arrived at Chateaux d’Osmond and parked in the shade next to the vines. Anne went looking for the owner and Philippe came out to greet us. If you are interested in wine you can read more about the wine of Chateau d’Osmond here. On a tour of the barrels at Chateau d’Osmond. Later in the day Philippe took us on a tour of his wine storage tanks, the storage barrels and the building where he bottles his wine. He told us that one barrel makes 300 bottles of wine and he sells to Sweden, Germany and Japan. We were looking forward to the wine tasting and it didn’t disappoint. We tasted the deep coloured red, the limited edition Petit Verdot and a very dark unique Rosé all of which were outstanding wines. Whilst there is no obligation to buy we decided to buy 12 bottles at a cost of €106, so the free night turned out to be an expensive one! The official Bordeaux classification for the wines we bought is Cru Artisan du Médoc and is a classification used for small and medium wineries where the wine is bottled at the chateau. Only 44 vineyards have this classification. Cabernet and Merlot grapes growing at Chateau d’Osmond and due to be harvested at end of September. 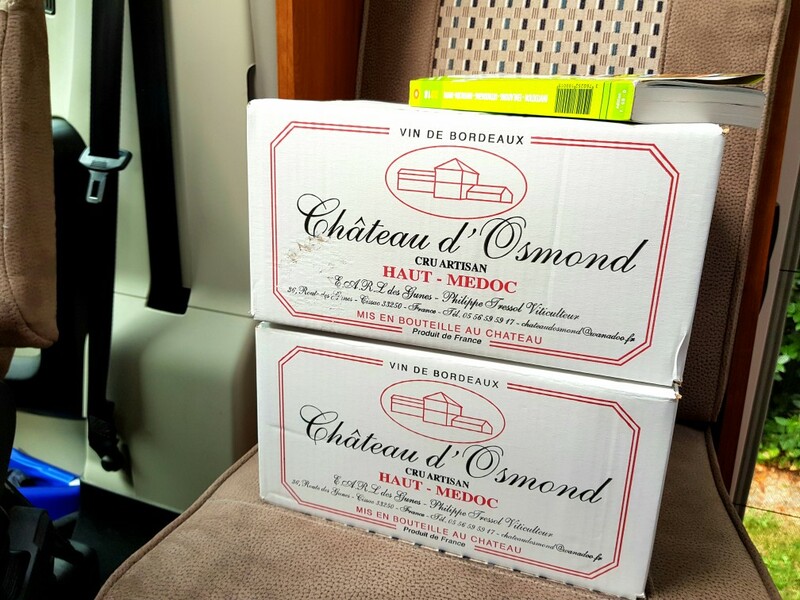 Not sure where to put our two boxes of wine from Chateau d’Osmond. Hi Sue. We aim to do more France Passion too. Cheese making sounds great. Better drink the bottles to make room for some more! Yes, great idea! Too expensive for everyday consumption. Special occassions only such as a Saturday night. Thanks for commenting. We hope to use our new membership of France passion when we holiday there is September. It’s great to see some of the beautiful places you stay. Thanks for sharing your journey. Hi Andrea. France Passion is very good. The vineyard owner was very friendly and it was so peaceful. I’m sure I’m sure you will love it.